I was recently on a Caribbean cruise ship, and took the behind-the-scenes tour (it was fun seeing an immersion blender the size of an outboard motor!). While we were in the pantry, I saw enormous bags of enormous carrots; that is, the bags were enormous, and each carrot was in itself enormous (perhaps 2" in diameter and over a foot long). I've never seen carrots anywhere near that size in retail supermarkets (in the Northeast USA), and I'm wondering why they were so large. Are they cheaper? Easier to handle? Better tasting? Or were the large ones what was most recently available, and another time I might have seen what I think of as "normal"-sized carrots? This is just a guess, I have no factual proof, but is it possible it is purely for aesthetic or decorative purposes? I am guessing in cruises, hotels and other festive, leisure, touristic or vacation occasions meals often have a certain flair, and presentation is a big part of it. Plates, tables, rooms, etc. are often adorned with purely aesthetic artifacts like small sculptures or ornaments made of fruits, vegetables, other edible and non-edible decorations. I imagine larger pieces (of any material) provide more creative freedom. By yielding larger chunks, bigger vegetables be cut into different shapes and allow sculpting more inventive forms with attractive appearances. 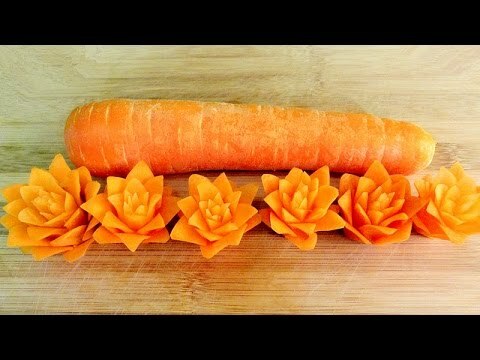 Carrots for their consistency and bright color make a good edible medium for these decorations, and larger ones probably provide the artist/cook more freedom, less waste and flashier results. Alternatively, maybe some particular dish served on board also requires larger carrots, like some sort of stuffed carrots, or something served over a carrot as a vessel. There may also be economic or logistic reasons, like saving space and money. Ships generally have inherently limited storage space; larger products pack better and store more efficiently by wasting less space per effective amount of usable product both saving space and money aboard a cruise liner. Many reasons. When you put them in a automatic peeler they lose 1/3 in size. Carrot flakes are used in other foods & juice. Only store grade size are shipped to stores. Many big & small carrots are sold to other business. Large carrots go into baby food canned soup, juice. They are cheaper to buy. You never know once processed what size they were. It use to amaze me the size of carrots I would see shipped from California to canning plants in box cars under ice to the rest of America. There's an economics reason for large carrots -- they're cheaper to process. Peeling generally goes to the same depth no matter the size of the carrot, so removing 2mm from a 5cm (2") carrot is 1/4 the loss as from a 2.5cm (1") carrot. And it takes time, even when it's being done by a machine if someone has to handle 4 carrots as opposed to one. And that loss has to be disposed of, which can be an additional cost when you're at sea. The reason that you don't see them in most American grocery stores is that these days carrots are often sold in 1lb, 2lb and 5lb bags in the US ... so you need smaller carrots to get the bags to the correct weights. When you're buying 50lb bags of carrots, it's not a big deal if the carrots weigh a pound each. If you want to find large carrots in the US, I'd recommend international grocery stores -- around me they tend to favor price over other cosmetic concerns (eg, the apples might not be uniformly colored, but they're 1/2 to 2/3 of the price). Not the answer you're looking for? Browse other questions tagged carrots restaurant or ask your own question.